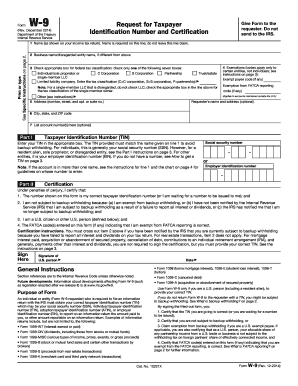 Irs 1065 Form 2013 is not the form you're looking for?Search for another form here. Are you a member of a business partnership? 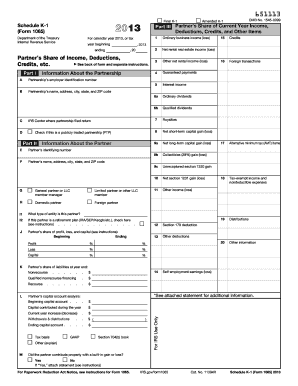 If so, this IRS form 1065 Return of Partnership Income is one you're going to want to share! What is the purpose of IRS Form 1065? The purpose of IRS Form 1065 is to report various taxable events relating to the partnership, such as reporting income earned, capital gains, losses and deductions. Who needs to file Form 1065? IRS Form 1065 is an information return that is completed by certain partnerships. Generally, domestic partnerships and foreign partnerships that have gross income connected with a trade or business in the U.S., or that have gross income from U.S. sources, must file a Form 1065. When is the Form 1065 due to the IRS? Effective for tax years beginning after December 31, 2015, the original filing due date for a calendar year tax return is March 15th. If the partnership has elected to have a tax year other than the required tax year, then the filing due date for Form 1065 is the 15th day of the 3rd month following the close of the tax year for the partnership. The extended filing due date is September 15th, unless the partnership has elected to have a tax year other than required tax year. In that case, the extended due date would be 6 months after the original filing due date. How is the Form 1065 Completed? IRS Form 1065 consists of 5 pages. Following is a brief explanation of each page. • Page 1 requires the taxpayer to provide general information about the partnership, such as the name of the partnership, address, employer identification number, principal business activity, the date the business started, and total amount of assets. • Page 2 and 3 are Schedule B (Other Information). The information required on these pages directly relates to the partnership, such as what type of entity the partnership is, whether the partnership is publicly traded, whether or not the partnership had any cancelled debt during the tax year, and numerous other questions. The last section of the Schedule B relates to the Designation of the Tax Matters Partner. • Page 4, Part of Page 5 are used to report Schedule K (Partners’ Distributive Share Items). The Schedule K consists of 8 sections; income (loss), deductions, self-employment, credits, foreign transactions, alternative minimum tax items, and on page 5, Analysis of net income (loss). • Page 5 is the Schedule L (The balance sheets per books information), Schedule M-1 (Reconciliation of income (loss) per books, and the Schedule M-2(Analysis of Partners’ Capital Accounts). What is the mailing address for Form 1065? When you have completed Form 1065 and all the associated forms, where you mail it depends on the state that the partnership is located in, and the total amount of assets that the partnership has at the end of the tax year. Refer to page 4 of the IRS written instructions for the various mailing addresses. 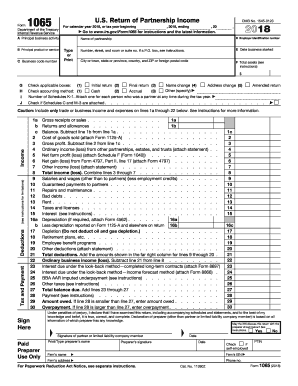 Forms · Historic Tax Credits 2013 · Information and FAQ s.